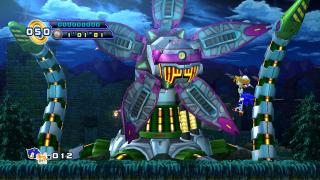 The Sylvania Castle Zone Boss starts looking like a rehash of the Aquatic Ruin boss; however, tentacles rise from the ground, smashing the totem poles revealing the true boss which snaps into Eggman's capsule like a giant living techno plant. To fight this boss, you need to fly up with Tails and hit the Eggpod when it is not encased in the plant. Avoid the slamming tentacles while doing this. When the boss has half-health, more tentacles rise to attack you. When the boss is down to its last two hits, the tentacles attach themselves to the trunk of the plant and begin absorbing power from the earth. After a few seconds, Eggman unleashes a laser that spans the length of the screen and fires it in a clockwise rotation around the entire screen. To stop the attack, hit Eggman without hitting the laser. Repeat once more to destroy the robotic plant. This page was last edited on 24 February 2018, at 22:36.